The floating TMX panel provides access to your TMX memories in any application. 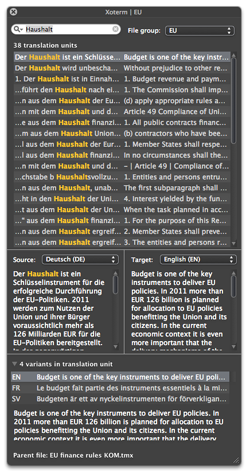 Xoterm for MacOSX is a viewer for TMX (Translation Memory Exchange) files. It displays a floating TMX reference panel with a search field. Simple: Searchable panel with loaded TMX data floats on top of other applications. Global hot key: Show/hide the panel with a customizable keyboard shortcut that works in every application. Leverage your translation memories: If you currently work with a CAT tool (PC or Mac), most likely you will be able to export your translation memories to TMX format and use them with Xoterm. 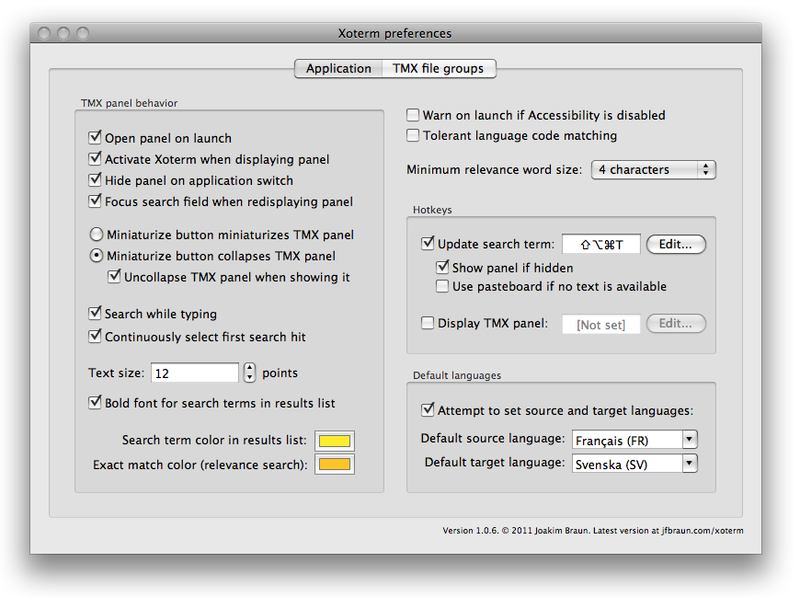 Xoterm provides customizable file groups for different assignment types and customizable global keyboard shortcuts. Pricing: Xoterm is shareware at USD 25.00 per license. System requirements: Tested on MacOSX 10.5 Intel. Version 1.0.8: Fixed display of search terms in translation unit fields. Version 1.0.7: Greatly speeded up TMX file parsing. Version 1.0.6: Further search options, bug fixes and UI improvements. Copyright (c) 2012 Joakim Braun E-mail Download Xoterm 1.0.8 • User manual (PDF). TMX test file (EU Charter of Fundamental Rights, 9 languages).